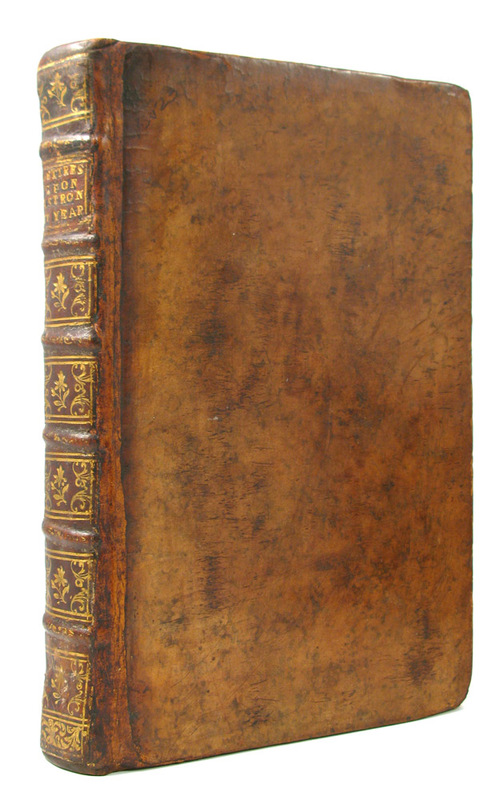 Concerning the Rise and Progress of Astronomy among the Antients. Notes: Costard (1710-1782) was educated at Wadham College, Oxford, where he became fellow and tutor. 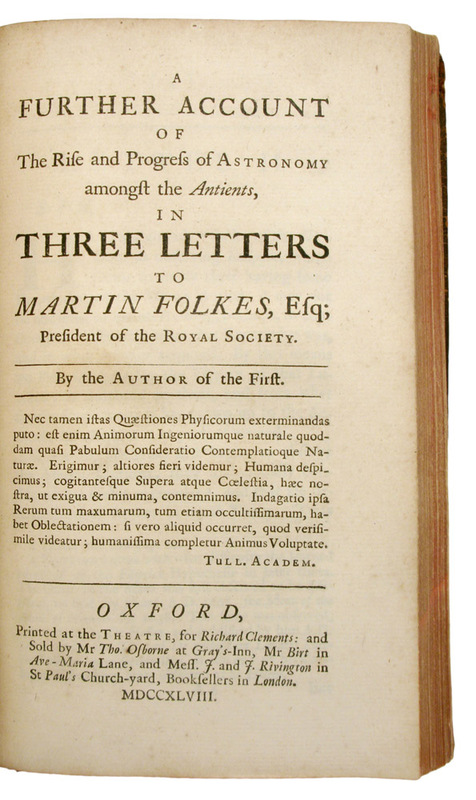 One of the earliest writers on the history of astronomy, his Letter to Martin Folkes and Further Account treat the Astronomy of the Chaldeans, of the Constellations in the Book of Job, and of the Mythological Astronomy of the Ancients. 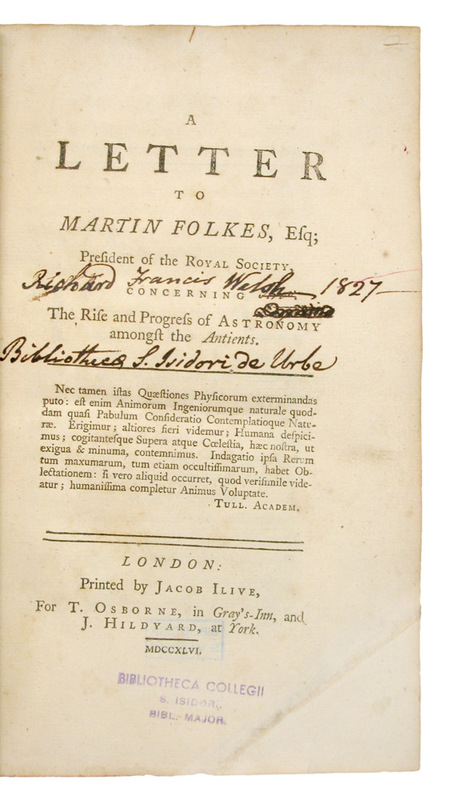 In his view exact astronomy was a product of Greek genius, beginning with Thales, and owed little either to Egypt or Babylon. His works are still worth consulting for the frequent references to and citations from Hebrew, Arabic, and the less-known Greek authors containe...moreCostard (1710-1782) was educated at Wadham College, Oxford, where he became fellow and tutor. 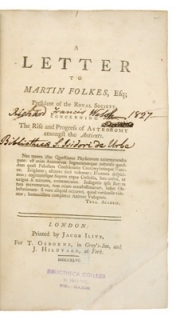 One of the earliest writers on the history of astronomy, his Letter to Martin Folkes and Further Account treat the Astronomy of the Chaldeans, of the Constellations in the Book of Job, and of the Mythological Astronomy of the Ancients. In his view exact astronomy was a product of Greek genius, beginning with Thales, and owed little either to Egypt or Babylon. His works are still worth consulting for the frequent references to and citations from Hebrew, Arabic, and the less-known Greek authors contained in them. 'In parliament [George Parker, second earl of] Macclesfield was a principal proponent in 1752 (with Lord Chesterfield) for the adoption of the Gregorian calendar and the change in the new year from 26 March to 1 January. 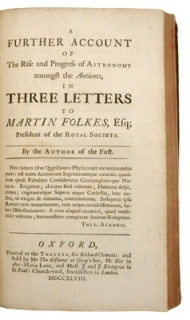 He communicated to the Royal Society on 10 May 1750 a preparatory paper entitled 'Remarks upon the solar and the lunar years' and made most of the necessary calculations, and his speech in the House of Lords on 18 March 1751, on the second reading of the Bill for Regulating the Commencement of the Year, was printed by general request. Lord Chesterfield wrote of him as the virtual author of the bill ... Macclesfield's action in the matter was in some quarters unpopular. When his eldest son, Lord Parker, contested Oxfordshire in 1754, one of the cries of the crowd was, "Give us back the eleven days we have been robbed of"' (ODNB).